Maya Macdonald's "Leave the Balcony Open" bears an uncanny resemblance to my own rather recent college experience. The play's central event—the deaths of two students—happened at my university almost exactly as they unfold onstage. (One fell from a window; one hanged herself in her dorm room.) I remember being a naive undergraduate, not dissimilar to Macdonald's rich characters, and her play is a haunting reminder of that period in my life. She has crafted a heartbreakingly real examination of the quarter-life crisis, when escape—through substances, jokes, silence—feels like the only option. May and June are best friends, but May is reeling from the loss of her boyfriend and ignores reality through June's alcohol supply. May's birthday is in three days, which is also the day of her graduation, and she doesn't think she'll live to see 21. The drama unfolds over that time, and the almost-alumni must explore what it means to release the college crutch. A prospective student called Prospy (and less often by his given name of Matt) throws the students off course when he stops by to check out the school. The self-possessed 18-year-old (a talented Jerzy Gwiazdowski) has been "exonerated" (he means "emancipated") from his parents and is visiting classes late in the year. Matt soon meets the cohort: Badly Drawn Johnny Depp, a neurotic jock type who subsists on Xanax and other meds; Silent Gen, a smart student who takes a vow of silence after her friend dies in an accident; and I Almost Died Cathy, a deeply scarred, insecure girl who uses her past as an excuse for avoiding her future. There is a different party each night, with the telling themes Sink or Swim, Superheroes Versus Supermodels, and Party Like You're Ready to Grow Up. Students disappear into costumes while Facebook-like status updates are projected on the wall. Gabriel Hainer Evansohn's chaotic set is distracting, and the explosion of lumber planks is unnecessary. A simpler set would have sufficed, as the heart of the work is the characters. 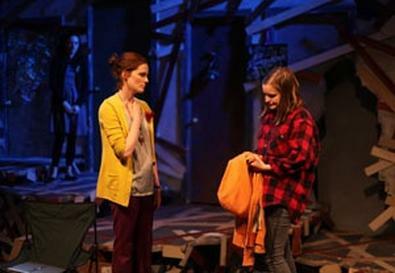 Director Jessica Bauman elicits top-notch performances. Betsy Hogg brings May's inner turmoil alive in a multifaceted portrayal. Anna O'Donoghue enlivens June, a generally flat character, finding her stride in June's mothering nature. (The instinct manifests physically in June's constantly wearing a fake pregnancy belly, which is slightly off-putting but understandable.) Jared McGuire beautifully balances comedy and drama in his Johnny, and when he says, "I am alive, and it's not fine," his delivery is affecting. Mary Rasmussen has the challenging task of acting without lines, but she is able to convey Jen's needs in a simple glance. Julie Kline is unexpectedly funny as Cathy, but her most moving work comes when, as part of a two-person chorus with McGuire, she recounts stories of students who died. Finally, Heidi Armbruster is disarmingly unassuming as drama teacher Chrissy, who finds herself almost too entangled in the students' lives. I remember what it is like to be at this stage of life and the fear and distress that change inevitably brings. These talented actors, almost all of whom have Broadway credits, flesh out Macdonald's resonant work in grade-A fashion. Presented by New Feet Productions at 3LD Art & Technology Center, 80 Greenwich St., NYC. Feb. 9–26. Thu.–Sat., 8 p.m.; Sun., 7 p.m. (Additional performance Mon., Feb. 20, 7 p.m.) (212) 352-3101, (866) 811-4111, or www.theatermania.com. Casting by Judy Bowman Casting.